Fine Art Graduate Ellie Davison-Archer completed a residency at Dumfries House. This outstanding Palladian mansion, saved for the nation in 2007 by Prince Charles and set in a 2,000 acre estate lies in the heart of a romantic landscape. For Ellie, who outlines her practice as focusing on the overlooked, and rediscovering the familiar through questioning our perceptions of natural form, the residency at Dumfries House was a perfect placement. 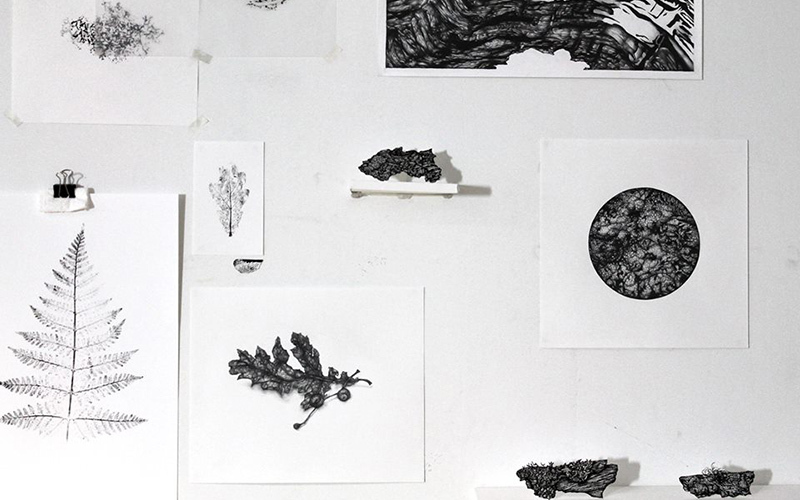 Ellie works towards obscuring the visual familiarity of found objects by investigating their hidden detail, creating macro representations with meticulous pencil drawing, printing techniques and fragmented objects. Resident artists experience a private working environment at Dumfries House, where they are accommodated in the Coach House flat and given access to large well-equipped studios. Work from Ellie’s residency is available online and more information about Dumfries House is also available online.